At the streets of Qlap, a new restaurant called Icebar & Cafe appeared on the first floor at the hotel where Funwok, the hongkong restaurant was located. 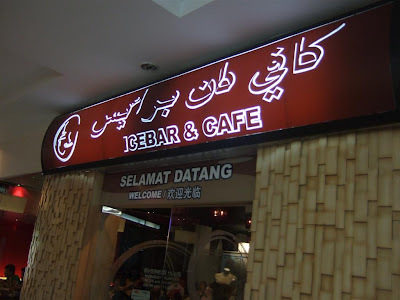 The restaurant's name showed no hint of what type the restaurant would be. One would wonder if it's a cafe for eating ice like Charmy snow ice or some fancy fine dining restaurant. 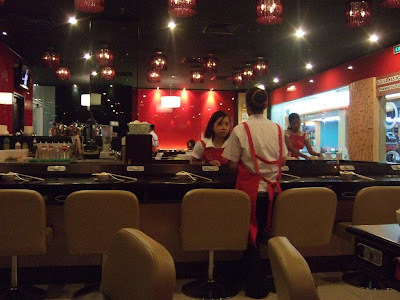 Instead, it's actually a Shabu Shabu place. 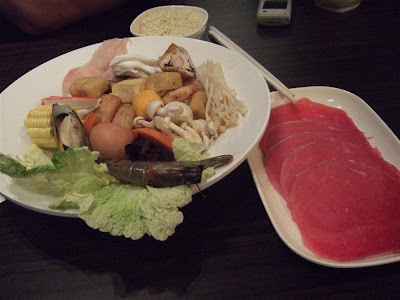 Shabu Shabu means you have your own soup (there are a variety of soups to choose from) and then you cook your food hot pot style. 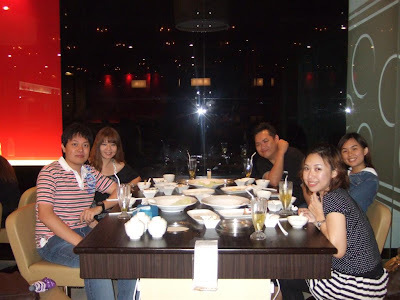 As you can see from the tables, each person has their own individual hot pot. The last time I went to a Shabu Shabu place was in Miri, so let's see how this places does. I did hear many complains that service was quite slow especially when it's packed, so if you're on a rush, definitely not a good place to visit. Fortunately, for me though, the service was not as slow as I expected. My drinks did take some time to arrive though. 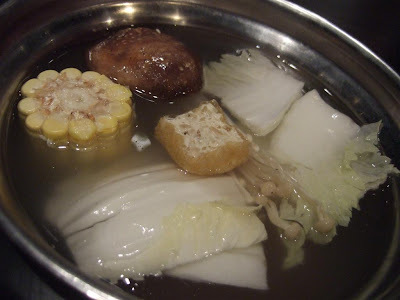 You can choose the type of soup you want and then choose your set of food you want to cook with your hotpot. This is the economy one which is around $8.80. You can choose to have beef slices instead of chicken. I definitely prefer the beef. Basically like a typical price for a steamboat dish per person. You can mix and match from the many ingredients and sauces they have available like a buffet style. 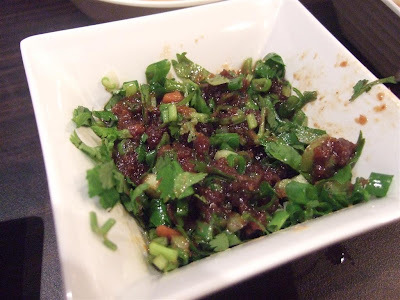 This is my special mix: black bean sauce, sar char sauce, sesame oil, garlic, chives and coriander(daun sup). Mixed well. Great dip! This is the normal seafood soup. 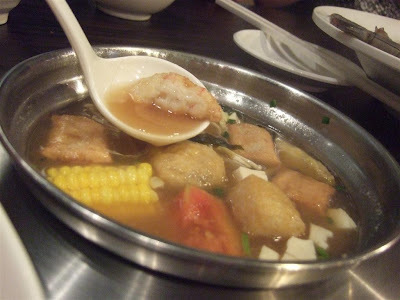 Although the flavours are not strong at first, and I feel that it tastes more like chicken soup than seafood soup, once you cooked a variety of your food in it, it get's better and better! The other soups tend to be overpowering. This soup is only $1.50, and refills are free of charge. This is the miso soup base. I really liked the flavours of this soup. Would definitely pick this one next time. $2.00 for the soup and $1.00 to refill. The hot and sour soup is for those who can really take spicy food! One sip of this made my lips and tongue really numb! 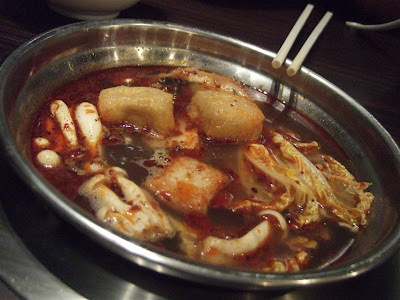 That's why in Taiwan they call this "MA LA Hotpot" which translates to Numbing Spicy Hot Pot. Definitely an experience for the adventurous ones. $2.00 to order, $1.00 to refill. I did not take pictures of other types of soups but the Tom Yum and Tomato based soups ($2.00 ) are worth a try as well. I personally tried all of them and if I could rank them, I would prefer the miso followed by tom yum, then seafood soup base. The others are good as well but that's just my preference. You can separately order your side dishes, such as this lamb here which is $6.00 per plate. I personally felt that this is too expensive for just 8 slices. I hope the management would adjust the pricing. 15 slices would be more appropriate. 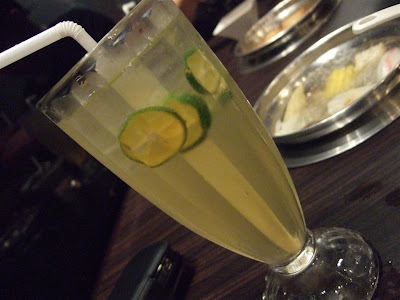 The drink Green Tea Calamansi is pretty good and I highly recommend it. 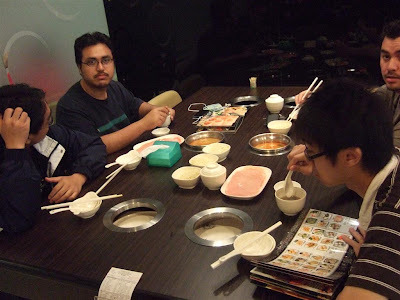 However, I wish they would give us complimentary cold water, especially if we're eating the hot and spicy soup bases. If they can give us complimentary sauces, I am sure they should give the customers complimentary iced water, if we order a few drinks from the table. This would greatly improve our overall experience. 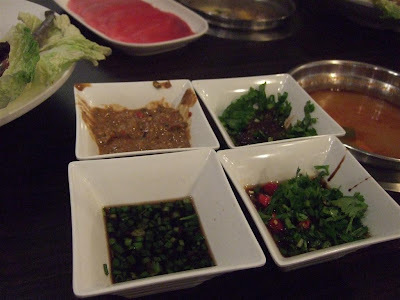 1) Include wontons and dumplings, or other possible additions to their hotpot menus. 2) Complimentary iced or warm water if the customers order drinks already at the table, to act as a fire hydrant for those spicy soup bases or sauces. 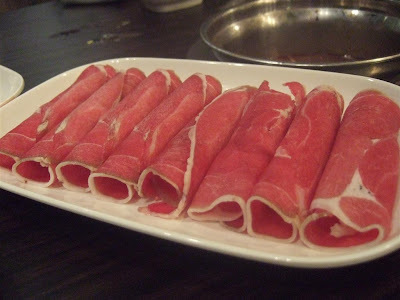 3) Be more generous on the lamb and beef slices when we order separate sets. $6.00 for simply 8 thin slices of lamb is simply ridiculous. Once again. 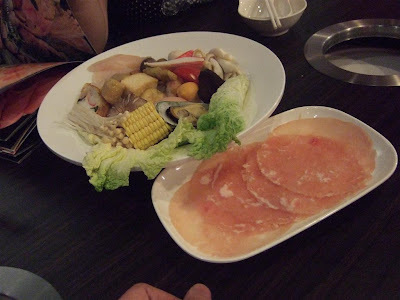 Thumbs up for Ice Bar's Shabu shabu and I am sure you will enjoy your experience there. Remember to book beforehand to avoid disappointment! Hi, nice posting on the Ice bar - one question though: are they halal? bad services for booking!!! waited 1hr plus! very disappointed n left. 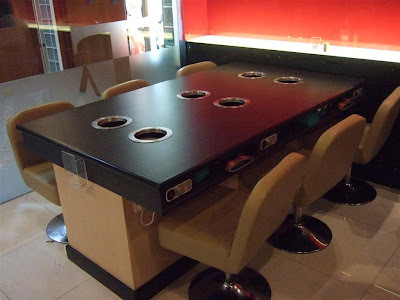 do u have their contact number so that i can make reservation? ?